Thanks once again to the many people who commented on my last two blog posts. All the feedback has been gratefully received. I just released Conduit 0.3.13 which, amongst other things, features some UI improvements based upon this feedback. 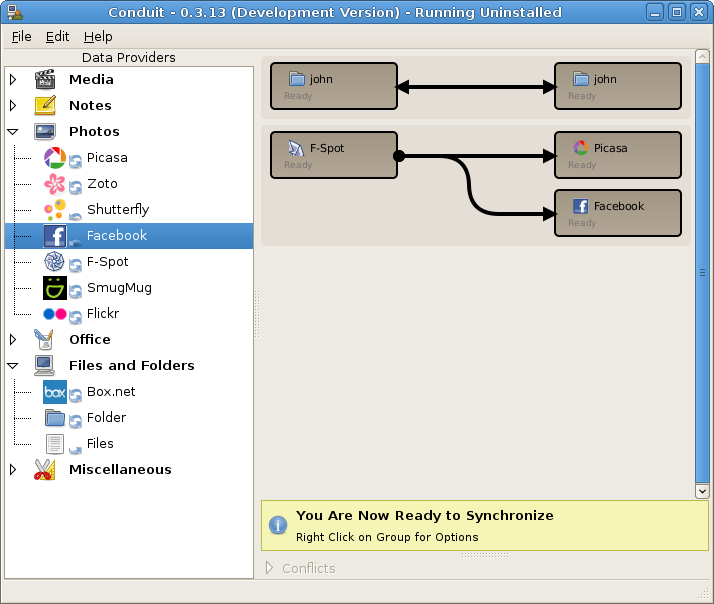 Improvements to the Conduit user interface. 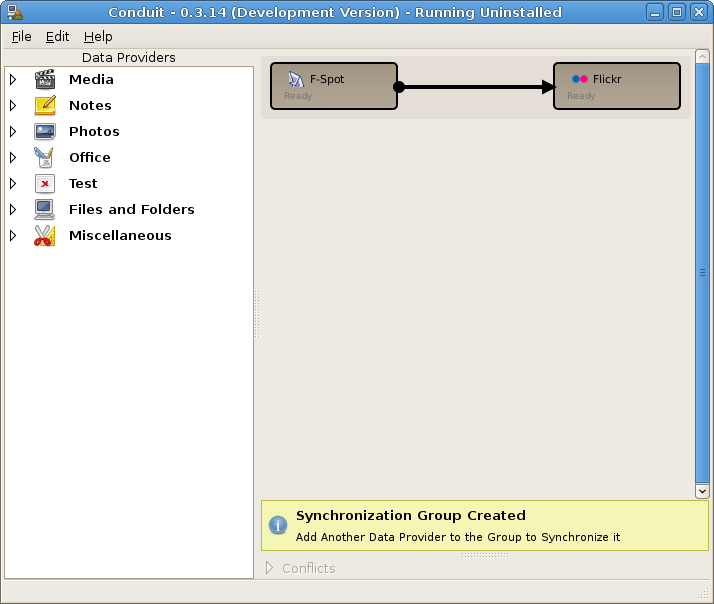 Conduit now ships with a few example synchronization groups. These groups are shown to the user based upon the devices connected, and the data providers loaded. 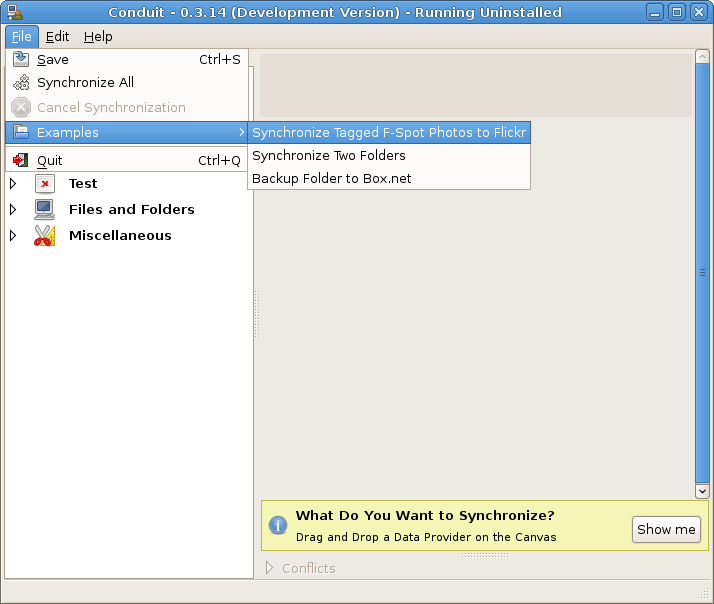 When the user selects an example, it is added to the canvas automatically. I have added a message area to the bottom of the window. This provides a limited number of hints to the user depending on their interactions with the application. John Carr is currently working on the ATK accessibility implementation. As far as we can tell, there are no other PyGTK applications that have implemented accessibility in manner we wish to (manual implementation of the Atk interfaces from a objects not derived from GtkWidget). Lucly he works with Mark! As far as using and distributing Conduit goes, it may get painful before it gets better. The next release will likely depend on PyGObject > 2.17 (for GIO support), and maybe PyWebkitGtk (SVN because of lack of recent, stable, compatible releases of this and WebkitGtk). My experience with (py)GIO so far has been exceptionally positive, and those out there who have used the train wreck that is gtkmozembed before will appreciate my desire to move to PyWebkitGtk.